"Part of the appeal was physical: his long, gaunt face, now getting the shadows and lines of maturity; his slender frame, curled over and around the microphone; his eyes, bearing hotly and steadily on the audience . . . which he held spellbound. Part of the appeal also was his manner: relaxed, offhand, friendly. Then there was his voice, a wonderful, natural instrument that could rasp out a honky-tonk tune or sob out a sad one." Few American entertainers have had the explosive impact, wide-ranging appeal, and continuing popularity of country music star Hank Williams. Such Williams standards as "Your Cheatin' Heart," "I'm So Lonesome I Could Cry," "Jambalaya," and "I Saw the Light" have all entered the pantheon of great American song. Nearly thirty years after his death, interest in his life and music flourishes as never before. The second edition of Roger M. Williams's authoritative and highly readable biography appears, therefore, at a most propitious time. 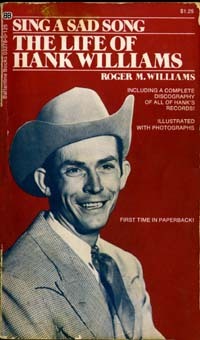 The author recounts the story of Hank's rise from impoverished Southern roots, his coming of age during and after World War II, his meteoric climb to national acclaim and star status on the Grand Ole Opry, his chronic bouts with alcoholism and the alienation it created in those he loved and sang for, and finally his tragic death at twenty-nine and subsequent emergence as hero. Roger Williams's judicious and sensitive portrait sorts through the facts and apocrypha surrounding Hank. His story resolves itself into a haunting image of a musical genius who fled the loneliness of "life at the top" - initially through the consuming joys of composing/performing but finally through the self-destructive refuge of heavy drinking. More than ever before, the book will be a treasure to scholars and fans of country music. To the new edition, the author contributes for the first time an index and an Afterword which details the tremendous growth of interest in Hank Williams during the 1970s. In addition, the book contains the most thorough discography so far published, compiled by Bob Pinson of the Country Music Foundation. ROGER M. WILLIAMS (no relation to Hank Williams) is the author of The Bonds: An American Family and until recently, was a senior editor at Saturday Review. He currently lives and works in New York City as a freelance writer for national publications.